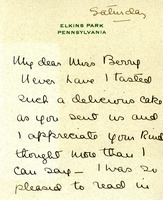 Ms. Suirles thanks Miss Berry for the cake she sent from the Berry kitchens and says she shall eat it with "earthly gluttony." She also wishes Miss Berry a happy new year. Pauline Shaw wishes Miss Berry a Happy New Years and also thanks her for the delicious cake she sent over. The thank you letter is to Miss Martha Berry for the cake that was received by Kate Chambers and was enjoyed by her Christmas family. 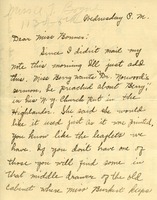 Letter from Harriet S. Whittelsey to Miss Berry, in appreciation for a cake which was sent with Christmas greetings, and making a $300 donation. Mrs. Ford writes to extend thanks to Miss Berry for the lavender sachet she sent her and to thank the girls of Berry for the cake they sent for Christmas. Mrs. Ford also says that they will start south on the 15th but can only spend a day with Miss Berry because they need to get back in order to travel to Europe on April 1st. 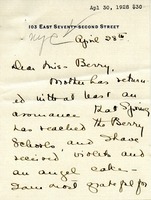 Elizabeth Elkins thanks Martha Berry for the cake that was sent to her and informs her that she hopes to send a contribution to the Berry Schools soon. 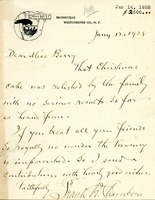 Frank R. Chambers thanks Martha Berry for the Christmas cake he received and sends a $2500 donation to the Berry Schools in return. Carnegie thanks Berry for the angel food cake. 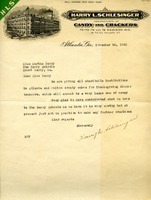 Mr. Schlesinger writes to say that he is giving all charitiable institutions in Atlanta and Fulton County cake for Thanksgiving dinner, which means that they will not have further funds to send to Berry.